This video demonstrates Dr. Scott Belsley performing a laparoscopic retrocolic, retrogastric gastric bypass with a hand-sewn gastrojejunostomy as a treatment for morbid obesity. Please note that this video contains scenes from a real operation and therefore contains images that could be unsettling. Please watch at your own discretion. The Roux-en-Y Gastric Bypass Gastric bypass requires the creation of a small stomach pouch and the changing the straight path of the small intestines into a bifurcated path similar to the shape of the letter ‘Y’. 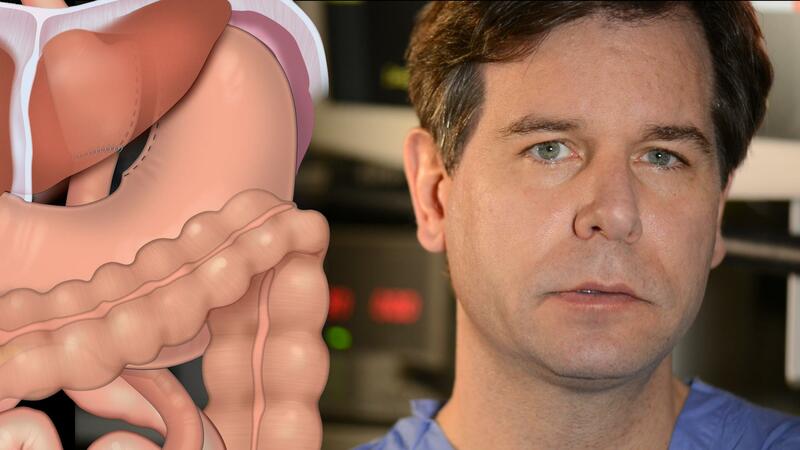 Two separate pieces of intestine will be connected in two new locations during the gastric bypass. The first portion of the jejunum becomes the biliary limb during a gastric bypass. It is called a biliary limb because bile and pancreatic juices flow through this portion of the intestine. An alimentary limb will be attached to the new stomach pouch . Alimentation, or rather food that is consumed, will pass down the esophagus , through the stomach pouch directly into this alimentary limb of the intestine. This anastomosis of two pieces of jejunum is called a jejuno-jejunostomy. The pouch of the gastric bypass is very small. The theory of the weight-loss operation is based upon separating almost all of the fundus of the stomach from the remaining gastric pouch. The fundus is the site of production of many of the hormones responsible for hunger. Dr. Belsley performs a hand-sewn four layer gastrojejunal anastomosis . Two layers are sutured posterior and two layers are sutured anterior. The stitch is run full thickness approximating the mucosa of the small intestine to the mucosa of the stomach.This creates a tension- free, precise, mucosal approximation. The final stage of the operation is to close the potential defects created by the alimentary limb passing through the mesentery of the colon. Interrupted sutures are used to close the mesocolic defect. Peterson’s defect is closed with a laparoscopic hybrid variation of Halsted’s suture and a purse-string. The connection is tested and the port-sides are then closed.